December/2016 - To talk about Sigma is always a curious experience on blog do zack. If it’s not for high performance primes, that mysteriously cost a fraction of first parties; or for large aperture, high resolution and inexplicable handling zooms, also not compatible with their prices; it’s for innovative ideas, not seen on most brands, that Sigma showcases how different its thought process is. The Sigma USB DOCK UD-01 is yet another example of such ideas, bringing an unique feature to the market, never offered before to the end user: the ability to connect a photographic lens to the computer, to adjust it at home, tailored to each person needs. To connect a lens to a computer? Is that a good idea? And, most importantly, why? Let’s find out in another blog do zack’s review. At 6.8 x 3.1cm with covers, at just 65g of plastics and metal, the USB DOCK couldn’t be simpler, given it’s not the most sophisticated piece of engineering. Like a lens mount adapter, the plastic, light, practically hollow cylinder has just one metal mount end, here tested on Canon’s EF standard; a lateral USB port, with a UC-E6 plug; a lens releaser, all plastic albeit well made; and a LED, that lights green when connected to the PC, or flashes when transferring data. Surrounding the plastic tube are engraved grooves, the enhance the hands grip, easier to mount. It all has a high quality matte finishing, with no barbs around the plastic cuts, typical of Sigma’s Global Vision. Besides simple, the USB DOCK usability is trustworthy, better than even more expensive adapters I’ve used. While low quality mounts usually give ERR01 error between the camera and lens, the UD-01 connection is solid, a must have when updating the lens. With golden internal contacts and a sturdy pin set, the USB DOCK is genuinely “MADE IN JAPAN”, like few accessories nowadays. The USB UC-E6 plug it tough, tight, although not the most popular: I would rather use a micro/mini plug like the ones I already have sitting on my desk, than using Sigma’s supplied cable. At least this cable is also high quality, flexible and long enough not the pull on the lens accidentally. So it’s all easy to use: plug the dock on the lens, the cable on the dock, hook it to the PC and you’re all set. For US$59 the USB DOCK is an idea well put together, not felling like a “beta” product. 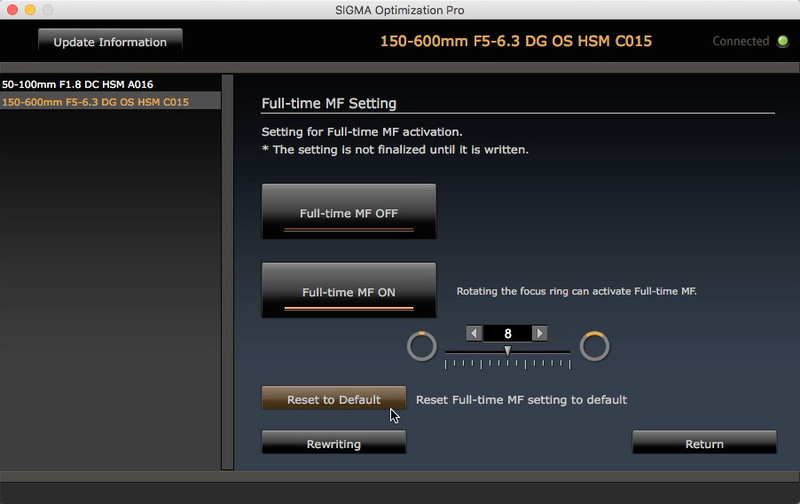 It’s finishing is typical Sigma Global Vision, high quality besides the low cost, with a complete kit. It’s interesting to see the UD-01 designation, that paves the way to future docks. I can imagine a Bluetooth dock, to be used with a smartphone; an optical-capable dock, a dock with… It surprises me that no other brand thought of such idea and, as we’ll see on, maybe the answer lies on its usefulness. If the dock is wall made, it would be nothing without a well-mad companion software to operate it. While I’m not a big fan of Sigma’s programmers, those who’ve read the DP#M review or use a Foveon Merrill/Quattro camera, knows the Photo Pro 6 fiasco, I was surprised to the see the (overly) simplified idea behind Sigma’s Optimization Pro (SOP). 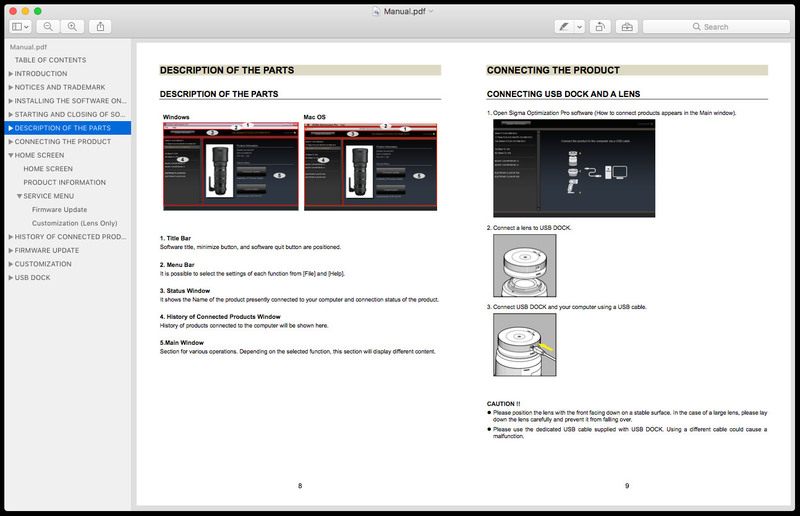 Its self-explanatory; the documentation is fairly complete; and it’s free from Sigma’s website, for Mac and Windows. Sigma’s Optimization Pro documentation: fairly complete and well developed, assuming you can read in english. Before talking about how the SOP works, it’s worth commenting on why the SOP exists. First, Sigma is not a licensed manufacturer to use other brands mounts, and they don’t know for real how each camera works. 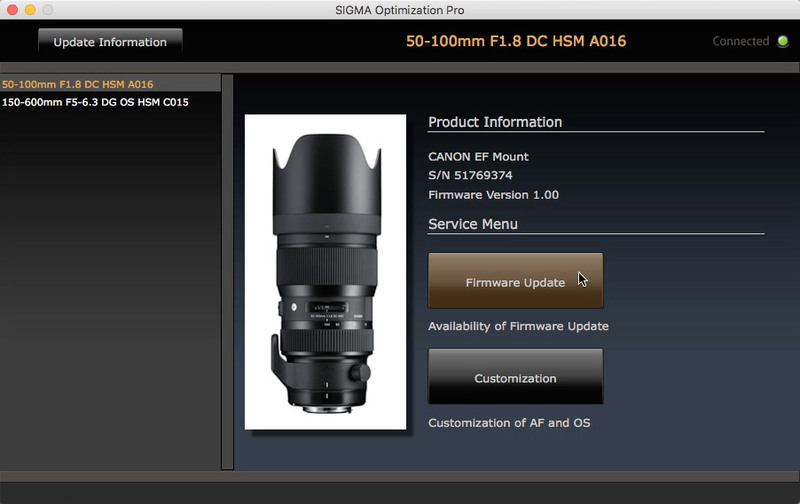 There’s no change of information between Sigma and Canon, for example, like there is on a “Made for iPhone” program, offered by Apple. 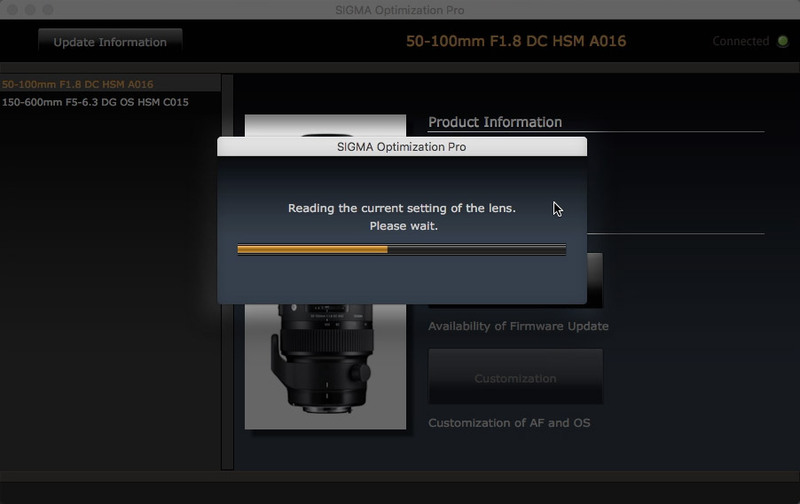 So sooner than later, Sigma’s lenses stop working on newer camera bodies, when the “oficial” manufacturer (first party) change the communications protocols. A firmware update is needed, and the dock becomes an important idea for Sigma. A big “but”, however, is the the USB DOCK’s compatibility only with newer “Global Vision” lenses (Art, Contemporary, Sports). Older models, like the popular 17-50mm f/2.8 EX that we’ll soon be reviewing, are not compatible, not allowing any updates. 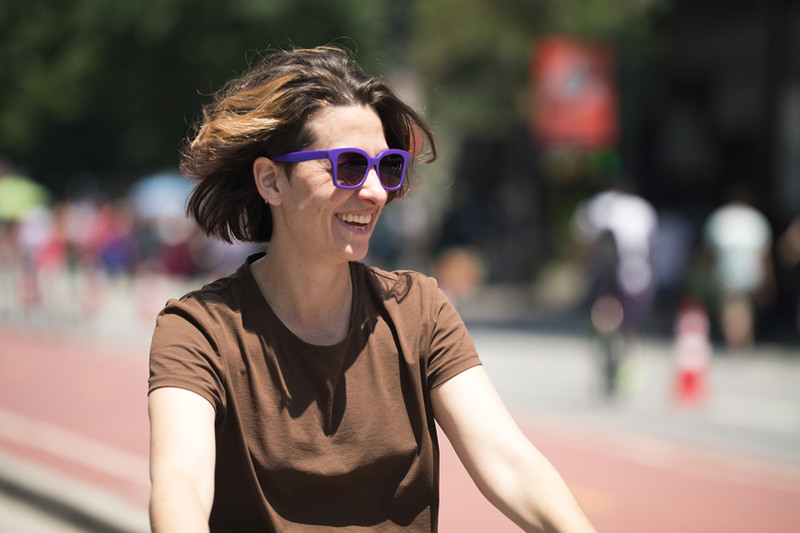 The SOP main features: firmware updates, and Global Vision lenses customizations. Second, given the precision necessary for the camera + lens combo to auto-focus, it’s not rare that we encounter the so called front/back focus issues, when the camera focuses a bit at the front or at the rear of the correct point. It’s those cases when it confirmed focus on your subjects eyes, but checking the files back at the computer screen, we get sharper noses (or ears). When that happens consistently, first parties recommend sending the whole kit, camera + lens, to be calibrated at the service center, by authorized professionals with the correct tools. 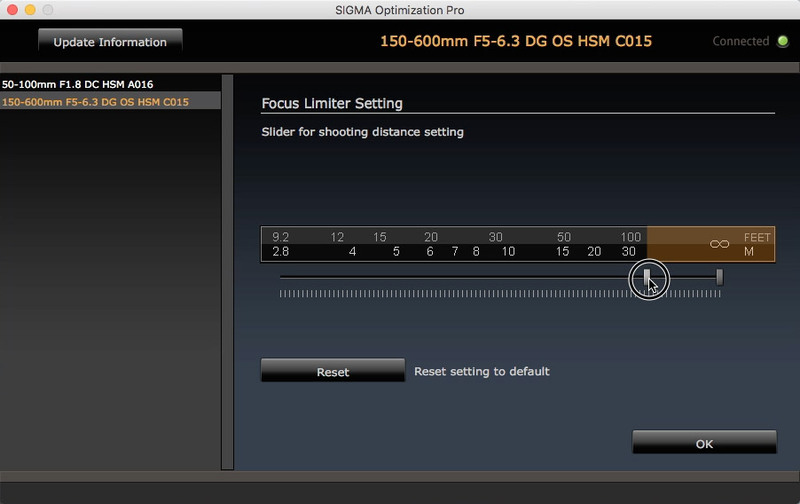 Sigma on the other hand offers the Optimization Pro, with an interface to do these adjustments at home. 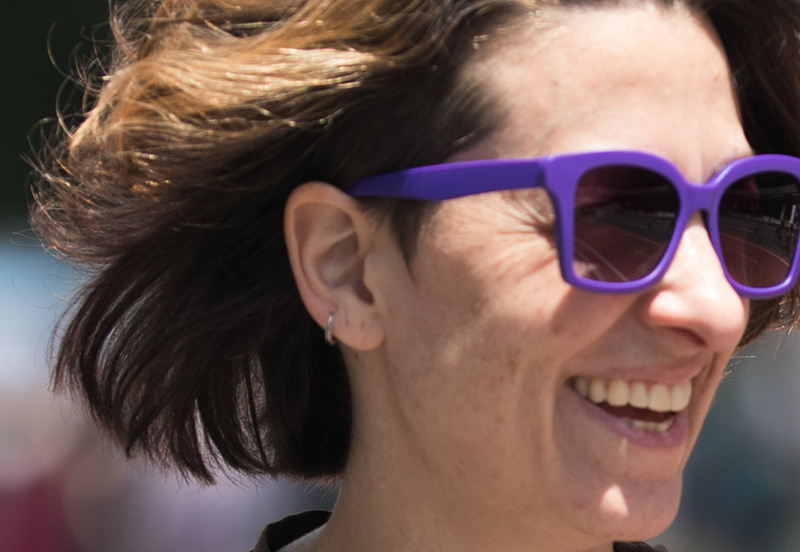 “Purple sunglasses” with the EOS 80D + Sigma 50-100mm f/1.8 DC HSM at f/1.8 1/2500 ISO100 @ 100mm. 50% crop, notice the sharp focus on the subjects neck, instead of the face; a classic example of back focus. With the lens connected to the computer, the SOP quickly displays it’s data on the screen, also activating the green LED on the dock itself. But the most annoying thing happens as soon as this stage: at each lens initialization, the SOP looks for a firmware update online, a process that takes about 10 to 20 seconds, depending on your internet connection speed. Yes, let me write that again: at each lens initialization, the software looks a firmware update, even if you’ve already done it, including during the running SOP session. This can make some adjustments very tedious, especially when you have to connected/disconnect the lens a few times. At each initialization, a “reading” screen pops up, looking for a new firmware. After the first contact and the SOP automatic firmware search, the connected lens shows up on the computer screen. Lens model, date of manufacture, serial number and even a lens picture shows up, so you are sure of which lens you’re setting up. To the SOP, however, this data is used to indicate which settings can be adjusted on your lens, that varies from model to model. On most primes, the focus adjustments can be done on 4 pre-selected focal points, from minimum focusing distance to infinity. On zoom lens, 4 focal lengths are added to each focal point, for a total of 16 adjustments; after all there’s no point compensating for the whole lens if you’re having issues only on a specific distance. 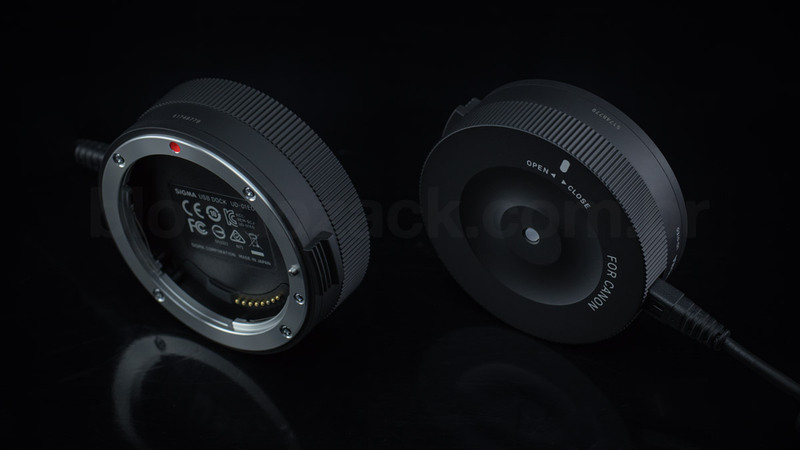 And for lenses sporting the Custom switch, the SOP enables the focusing speed, distance limiter, “Full-time MF” and stabilized adjustments, that don’t show up on the other lenses. So no speeding up for most Art primes, that doesn’t have such switch; lame. 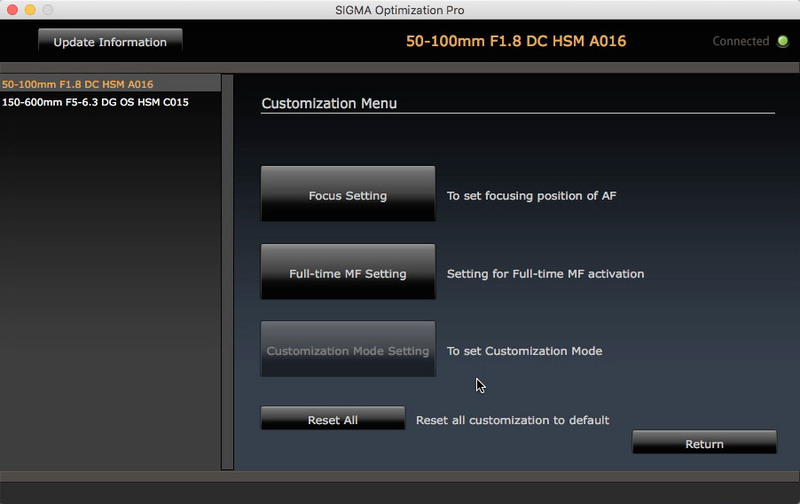 The Sigma 50-100mm f/1.8 DC HSM adjustments: only focus settings and “Full-time MF”, with no options for speed, limiter and stabilizer (obviously). From that, the adjustments are all straight forward, although Sigma fails in explaining precisely what you’re doing to your lens; my biggest issue with user-made AF MicroAdjustments. 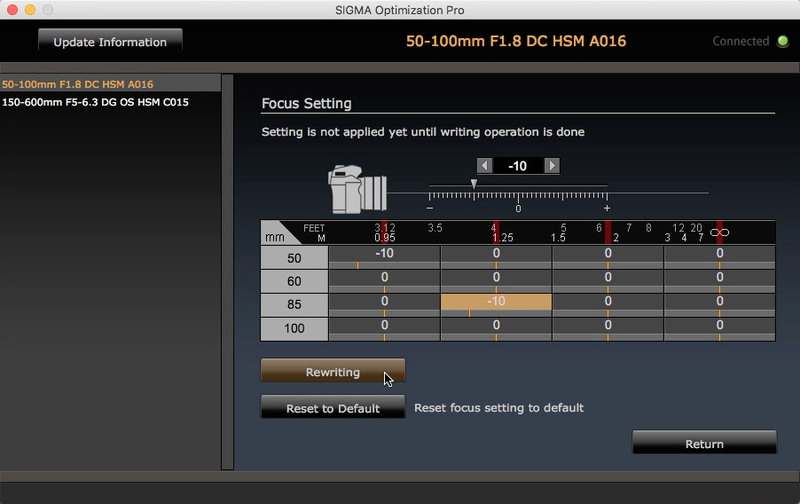 For example with the 50-100mm f/1.8 DC HSM zoom, the SOP does show an easy to understand table of focal lengths and focal points, all standard at zero. But nothing is indicated about 1) how to test your lens for front/back focus issues; 2) what is the correct value for each distance or even 3) what these “+5” or “-10” adjustments really are. And that’s a problem: IMHO, the end-user is not capable at fixing these lenses at home. To measure such a precise component like the auto-focus module using a ruler at home seems like a joke, and the software don’t take into consideration important aspects, like temperature or focusing angle. Sigma fails to recommend a valid procedure to testing, no matter how carefully made are the videos on their website. So it’s hard to recommend it..
“Focus Setting”: nothing more than a table to input values, not explaining what they mean nor how to correctly test them. 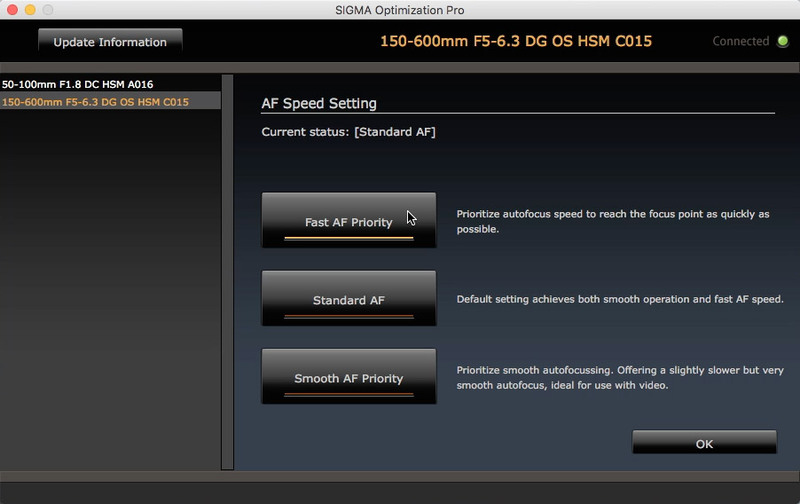 With the 150-600mm f/5-6.3 d DG OS HSM Contemporary, other adjustments are available. The optical stabilizer modes were shown on vlog do zack, but honestly didn’t make much of a difference. The dynamic and standard modes look the same: the viewfinder jitters a lot, making it hard to compose at 600mm. Maybe squinting my eyes I can see any improvement using the moderate mode. But overall, they all offer the same level of compensation during the click, that’s the most important part. The same can be said about the “focus speed”, one speed oriented, another smooth oriented. And the speed mode doesn’t make much of a difference, as it didn’t solve the lag between the camera and the 150-600mm focus; nor enhanced the motor speed at all. The auto focus speed adjustments, available only for lenses with a Custom switch: speed, standard and smooth. Finally the focusing distance limiter and Full-time MF adjustments are dead simple, but potentially the most useful. The distance limiter, for example, is a much better idea in order to “enhance” the focusing speed overall, than expecting more power to the motor. For landscape shooters, used to focus on faraway subjects, it makes sense to limit the lens drive to a shorter distance, let’s say 50m-∞, than the 10m-∞ offered by the lens itself. And the Full-time MF is the most sophisticated feature, programming the focusing ring to completely disengage to focusing motor when rotated, interesting for those not used to the rear AF-ON button on pro cameras. This mode gives the MF ring the ability to turn the AF off, even when the camera tells the lens motor to auto-focus. The auto-focusing limiter: a much better idea in order to speed-up the focusing process, with a shorter drive. 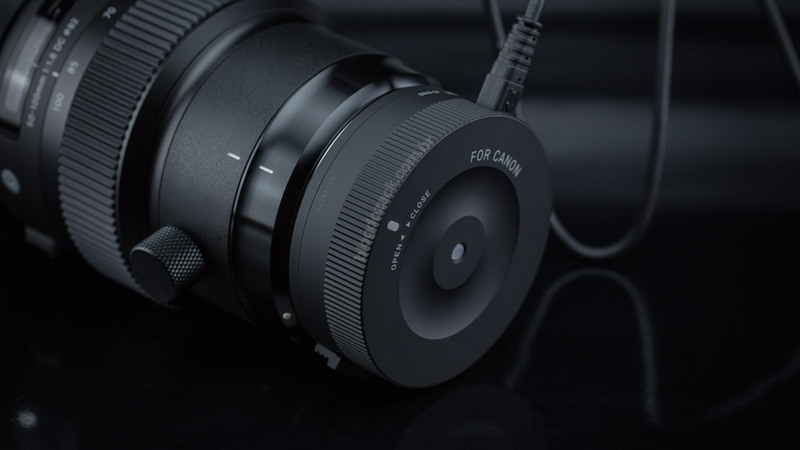 “Full-time MF”: use the manual focusing ring to completely disable the AF motor, even while the camera button is pressed. The Sigma USB DOCK is too new of an idea to judge if it’s good or not. It depends on how you look at it: for a third-party brand, it’s a long-term life-safer, updating the lens firmware with a “mount” from its own. But other features feel unnecessary at best, especially considering how well put together the Global Vision lenses are. I particularly disagree with the focus setting offered to the end-user, especially lacking any form of valid step-by-step testing; even feeling outdated. Nikon, for example, offers automated focusing adjustments on their recent D5 and D500 cameras, something other brands will surely copy. So the UD-01 is unnecessary, and my recommendation is to purchase it only when a lens firmware needs to be updated. Until then, nice shooting!